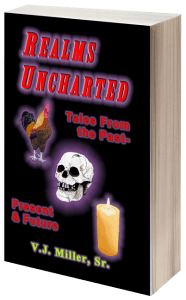 This story can be also seen in my anthology of short stories, “Realms Uncharted – Tales From the Past, Present & Future” that is currently available on Amazon Kindle and in PB from CreatSpace. Otto Dengler awoke slowly in the dark. He sensed first the uncomfortable chill of the air, then the pasty taste of his mouth. He reached for the blanket to cover his naked body but couldn’t find it. Stiff and sore from the cold, the mattress felt unusually hard; in fact, he could swear he was laying on a bed full of crumbs. He didn’t recall eating anything in bed; he never did that.